Another very nice course. Greens in excellent condition, very pretty to look at and friendly staff. I would definitely play here again. Played this course on our most recent holiday in Murcia and it is certainly the best so far. Some 45 minutes drive from the coast so more locals and less tourists, set on the top of a hill and in the middle of a very nice urbanization. There are some stunning views and it is kept in excellent condition – both greens and fairways. 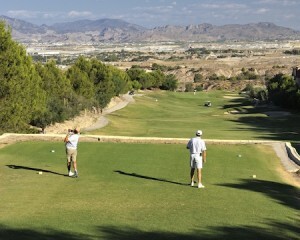 Less difficult than some of the other courses in Murcia but it was a delight to play and achieve a good score. The staff were very helpful and friendly – we played on a Monday morning and paid only 70 euro for two players and a buggy so excellent value – I think other days are more expensive. Not as busy as other Murcia courses. It is well worth the effort to find with the slightly longer drive – it is now our favorite and we will certainly play it again.